This week’s photo of the week is another shot from the cool morning I spent at Spray Lakes in Kananaskis Country just over a week ago. After first making the wide scenic shot from last week’s post along with a few other poor attempts (which I won’t be showing you! ), I honed in on a couple of details from within the larger scene. I had to move pretty quickly to get these last few images because the falling snow was coming down very thick and heavy by this point. I had spotted this little scene earlier and had the image in mind that I was going for so thankfully, it was pretty quick to set up. The biggest challenge of the morning was probably the task of changing lenses in the heavy snowfall. I’d been shooting the wider images with my 14-24 and needed to switch up to some longer glass for the detail image. It was quite a trick to remove one lens from the camera and then uncover the rear element of the other and make the switch without getting any snow on the elements or inside the camera body. I was very close to not even attempting the switch and abandoning the image altogether, but my better judgement (which might be debatable) kicked in and I went for the shot. Technically and compositionally this is a pretty simple image, and that’s exactly what I was going for. I used a longer exposure to smooth out the rough water and reduce the falling snow to more of a fog, (in this case 10 seconds did the trick) and set the white balance to daylight to retain the blue colour of the scene. 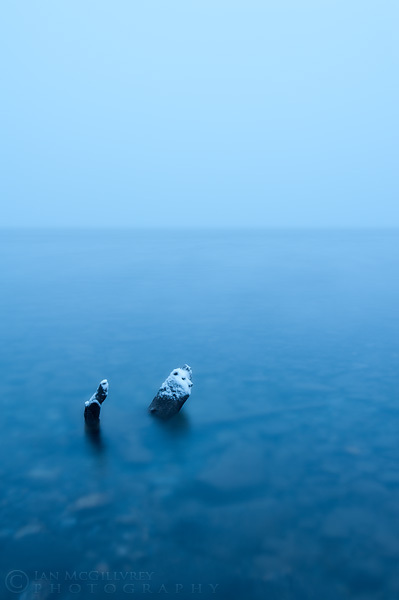 The composition was intentionally kept very minimal with the stumps on the lower left, placed using the rule of thirds, pointing up and into the scene. The horizon line was also placed at roughly a third of the way up the frame. I tried a couple variations on this one, first without including the horizon line, but then as I noticed the fog had totally obscured the opposite shoreline, I decided to include it as another layer of tonality. Looking back at them now, I much prefer this composition to the others. I didn’t use any filters and the processing was also very minimal with the final result looking very close the the raw capture from the camera. I really like being able to say something about a scene using as little as possible in the frame. Simplifying a grand scene down to just a few elements is quite a challenge but I find this process very rewarding. I realize it may not be for everyone, and it certainly doesn’t deliver much of a “wow” factor, but more and more I’m coming to appreciate the space and simplicity in this type of image. As it is in so many creative fields (I can certainly relate to this in my musical background), less really is more. Thanks for looking, I hope you enjoy this one!